There are now four Republicans running for the 72nd Assembly District, which includes part of Santa Ana. The Republican candidates include Huntington Beach Council Member Matt Harper (Supervisor Janet Nguyen’s former Chief of Staff); Westminster Mayor Pro Tem Tyler Diep; OC Board of Education Trustee Long Pham and Huntington Beach Mayor Joe Carchio. The Fountain Valley Republican Assembly has invited all of the prospective Republican candidates for the 72nd assembly district to their meeting. 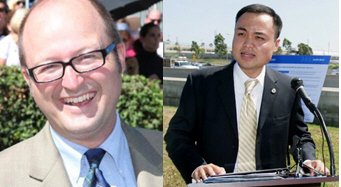 Huntington Beach councilman Matthew Harper and Westminster councilman Tyler Diep have accepted . located at Warner and Magnolia in Huntington Beach. The event is open to the public. The 72nd District includes the following cities: Los Alamitos, Seal Beach, Garden Grove, Westminster, Fountain Valley, Huntington Beach and Santa Ana. Is Long Pham going to be there also?